A non-Warriors colorway of the Nike KD 9 is set to release in 2017 with this upcoming Nike KD 9 Varsity Red edition. Dressed in a Varsity Red and White color scheme. 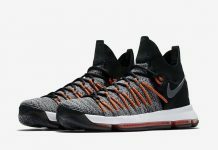 This Nike KD 9 features an all-Red Flyknit upper with matching inner lining and midsole. White covers the Nike Swoosh logos, as well as its rubber outsole. Look for the Nike KD 9 “Varsity Red” to release on January 1st, 2016 at select Nike Basketball retail stores. The retail price tag is set at $150 USD. 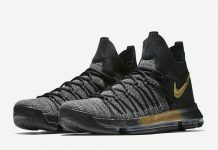 Let us know what you guys think of this new colorway and keep it locked to Sneaker Bar for more release updates as they develop. UPDATE: Detailed look via @gc911 at the Red/White Nike KD 9 that drops on New Year’s Day.